You will find this charming, modern, and well-decorated home amidst a stunning, rural landscape in the Hunsrück. This apartment, called the Hunsrückstube is comfortable and fully furnished. The house is fully equipped. There are 2 spacious bedrooms with high-quality beds. The kitchen and the shower are also quite well maintained. 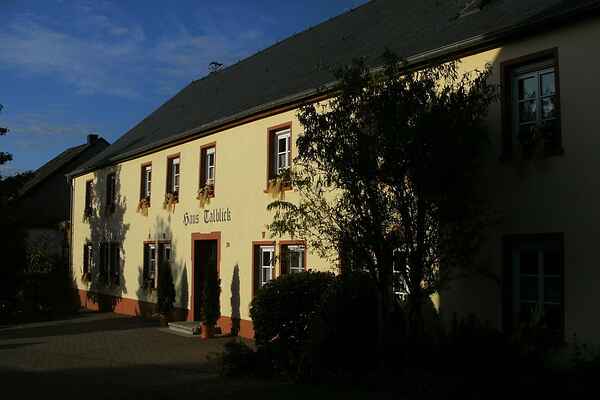 The fantastic wines from the Mosel region are extremely popular in the area. Imagine spending the evening taking in a gorgeous sunset with a fine glass of wine after taking a wonderful hike or visiting a beautiful city. Who wouldn't want that? We look forward to you visit! Trier Mosel Suspension Bridge Mastershausen is a village that offers you access to many things. The meandering Moselle is no more than 10 kilometres away and the Rhine is 20 kilometres away. The environment is popular among hikers, cyclists, and motorcyclists. Starting in September 2015, the longest rope suspension bridge in Germany, which crosses the Mörsdorfer Bachtal, will be ready and is just 2 kilometres away.